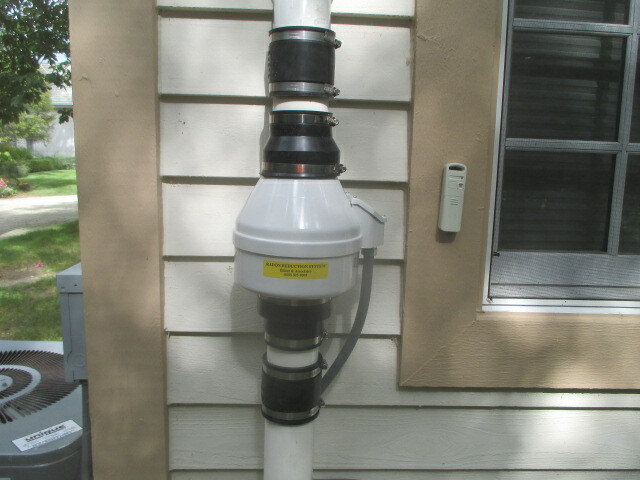 The radon fan can be installed on the outside of the home. We take care to make the system as inconspicuous as possible. The exhaust is upgraded to 4” diameter PVC and the fan raised to reduce the back pressure. 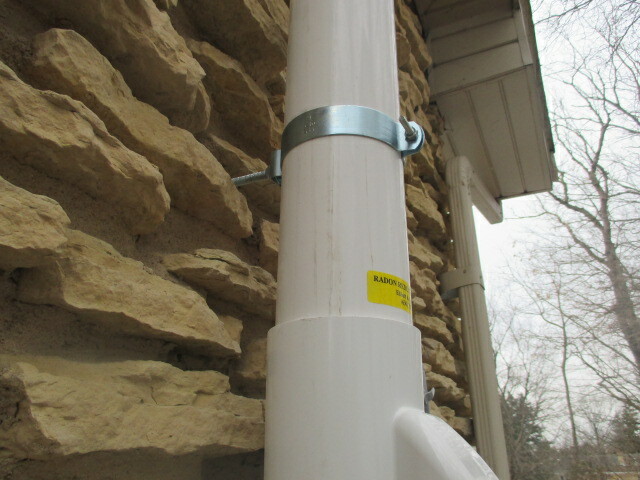 Two 45 degree elbows are used to provide the safest radon levels and reduce the potential for freeze-ups in the winter. 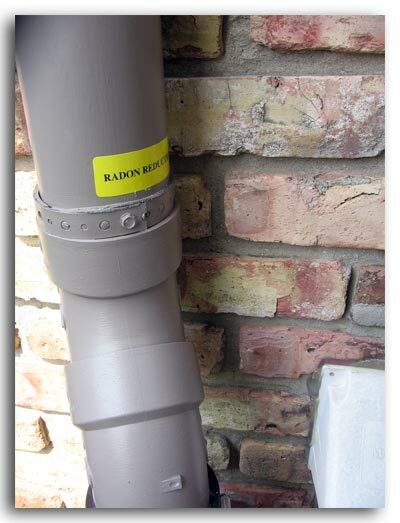 The radon system exhaust pipe must extend up the side of the house so that radon is exhausted above the highest eave of the home. 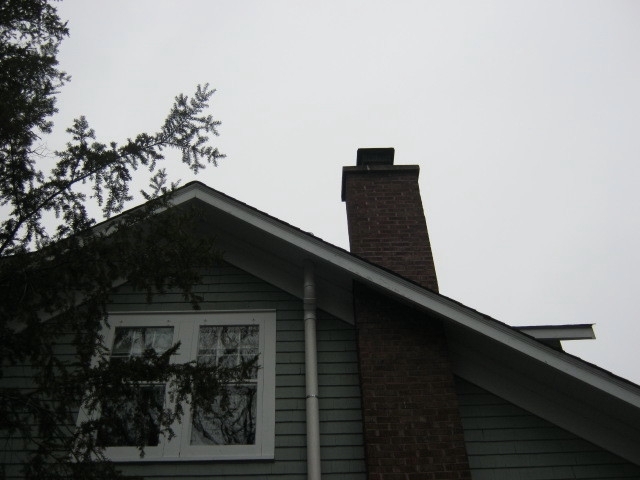 Here the exterior pipe is neatly installed behind the fireplace chimney. 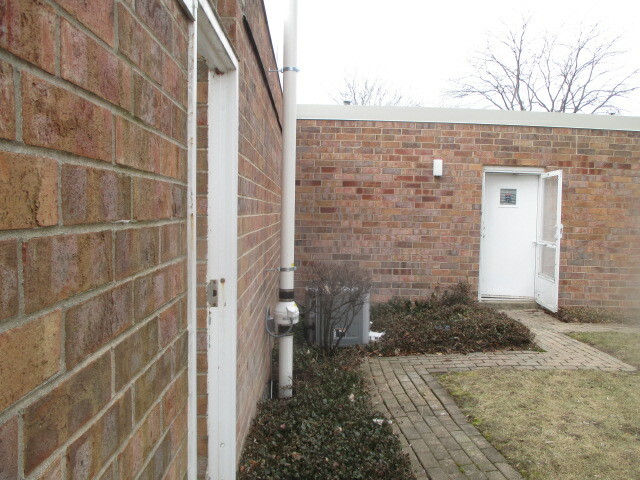 This exterior system is hidden behind a fireplace and tucked behind the AC condensing unit. The two extra rubber couplings near the fan provide optimum efficiency and noise reduction. NEW! We now offer white rubber couplings for a clean look! Our proven state-of-the-art noise reduction techniques are now available! This includes 4" PVC exhaust pipe and 2 additional rubber couplings that help to isolate and eliminate vibration noise transfer. Also included are mechanical pipe supports (not pictured) that are wrapped with rubber to isolate the noise. The fan is raised to reduce back pressure inside the system. Imagine a good nights sleep because of the two additional rubber couplings, which have been tested and proved to make a difference in hearing and feeling the vibration in the home. Exterior single story building with transition fitting. If you like the appearance of the transition fitting, we try to install the transition fitting as long as the following is true: masonry exterior and the vertical structural member (that will support the riser) is within ¾”. 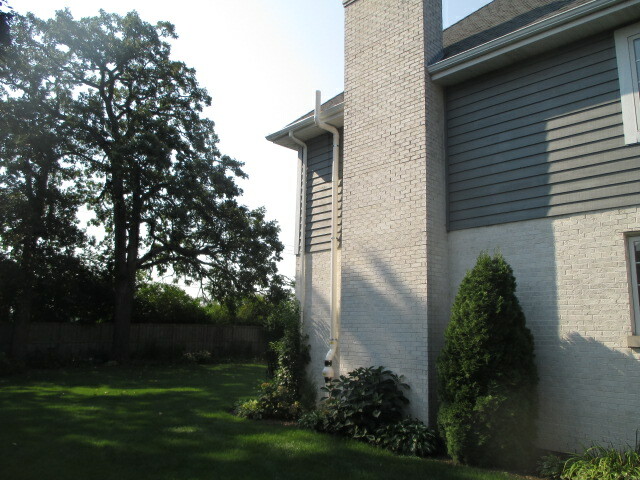 The radon system is hidden behind the chimney on the rear corner of the home. 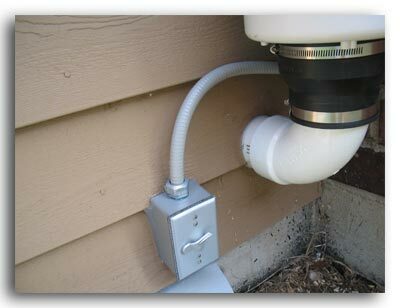 An on/off switch is installed within 4' of the radon fan and in view. 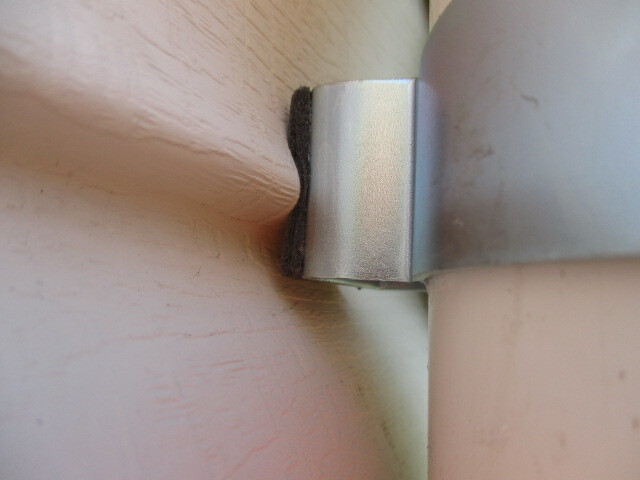 The electrical and pipe penetrations are sealed with caulk to make water tight. 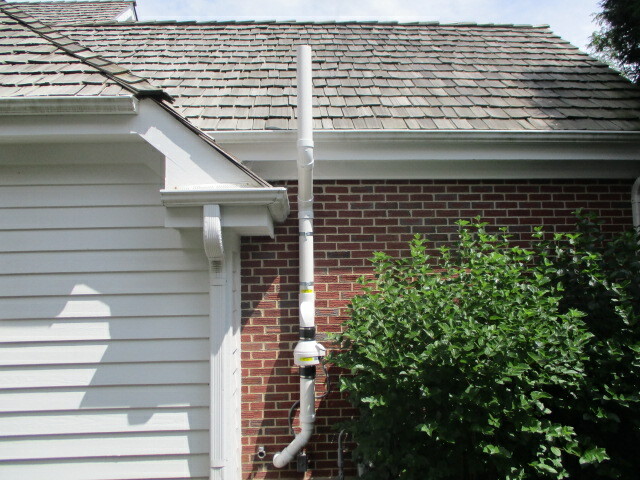 The exterior exhaust pipe must extend up the side of the house so that the radon is expelled above the highest eave of the house. 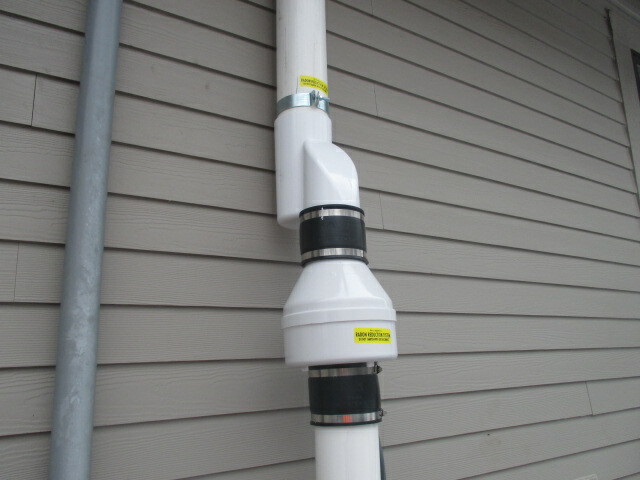 Based on our extensive experience, we highly recommend using PVC pipe as the exterior exhaust pipe over aluminum dowspout for the following reasons: PVC is a better insulator so the system will be quieter and there will be less chance of the system freezing up in the winter. Allows complete sealing of seams so there will be no leaking of radon or condensation and no chance for mold growth. 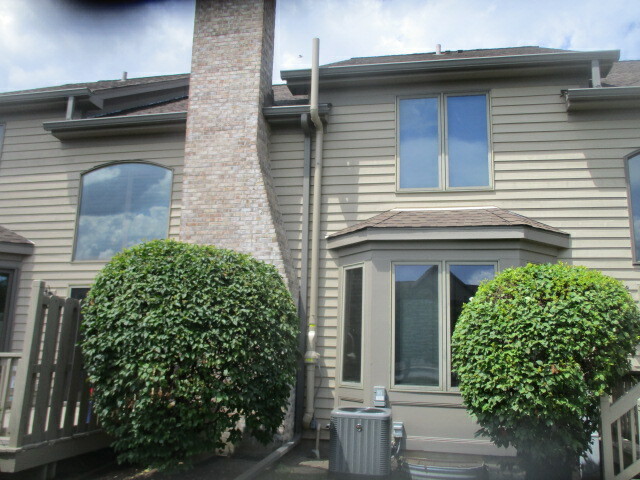 This photo shows the PVC exterior exhaust pipe painted to match the home for a more aesthetic look. 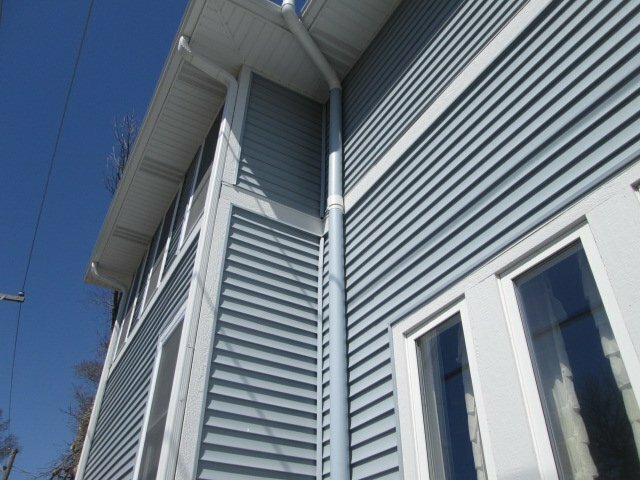 This photo shows the fan painted to match the home for a more aesthetic look. Exterior system located with the other utilites. Supports were extended to eliminate any unnecessary bends in the system to reduce noise and increase performance and safety. Due to the beautiful but uneven flagstone surface, a threaded rod was used to extend out and support the exhaust pipe. 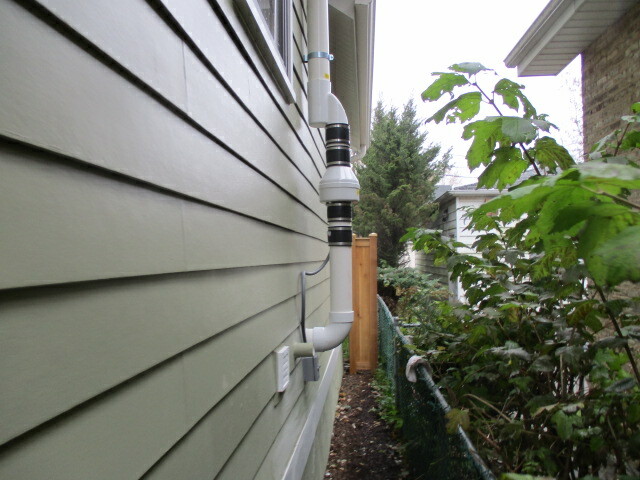 Painted radon fan and exterior PVC exhaust pipe. We can get creative painting the exterior exhaust pipe to match the house! 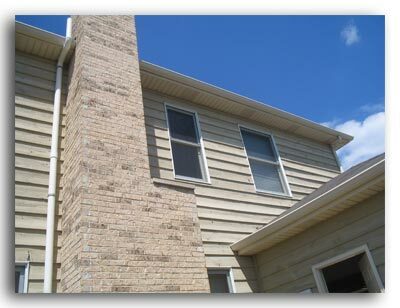 Can you see the radon system on this house? 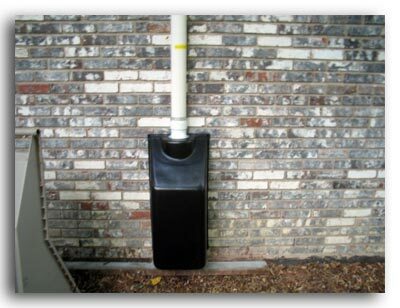 We can custom paint the exterior exhaust pipe to match your home. Our client wanted to hide the system and go through the first soffit. 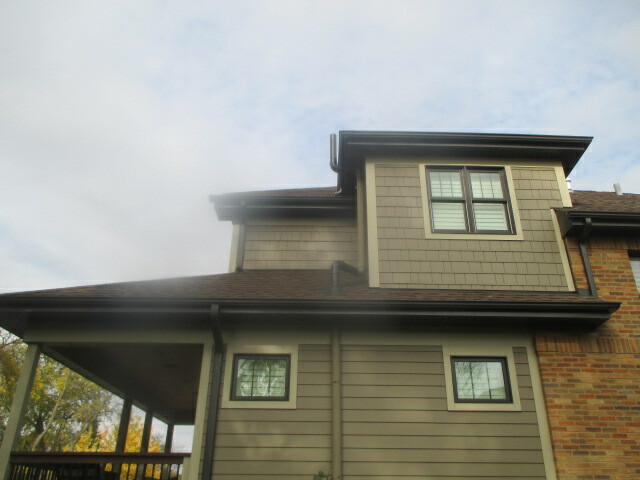 In this picture the system goes through the first soffit and around the second rear soffit. 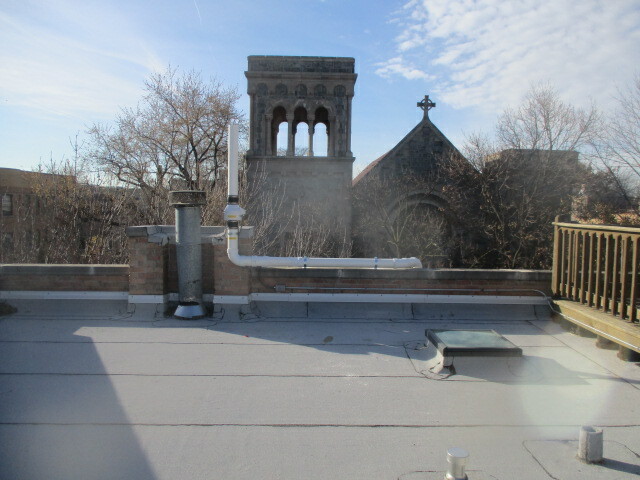 This is how the exterior exhaust pipe may look if you have a mansard style roof. 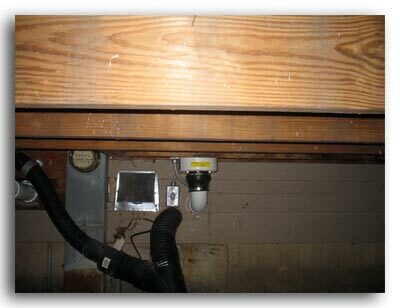 Can you see our radon system in this picture? 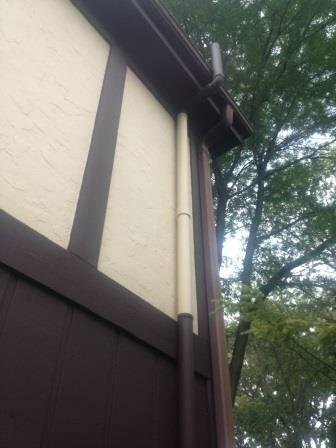 Got copper downspout? 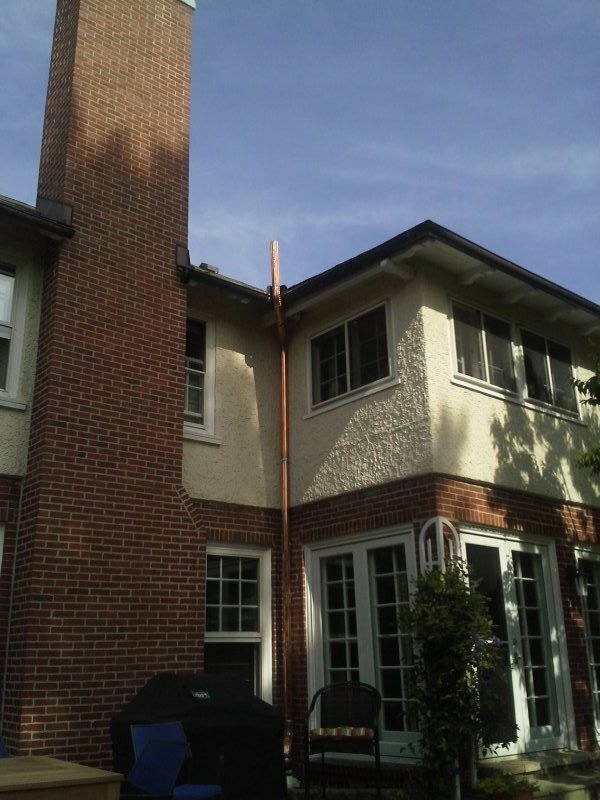 We can coordinate with a copper specialist to install copper downspout as your exterior radon exhaust pipe! 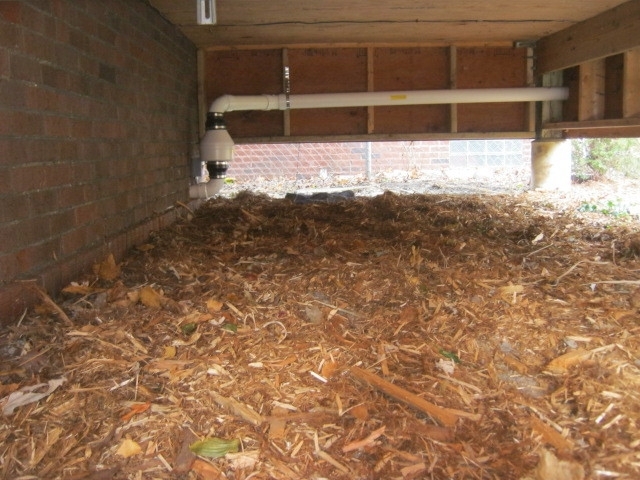 This photo shows the in-line vacuum fan hidden underneath a deck to help hide the radon system. 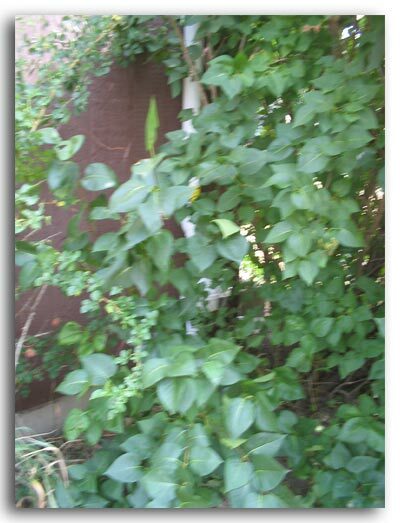 This system was designed to help hide the system, improving the look of the system. 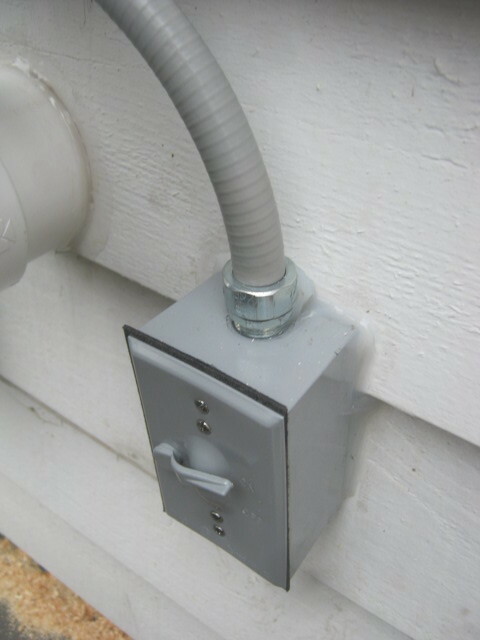 We can install a metal exterior box to protect the u-tube (manometer) when locating the u-tube outside is necessary. 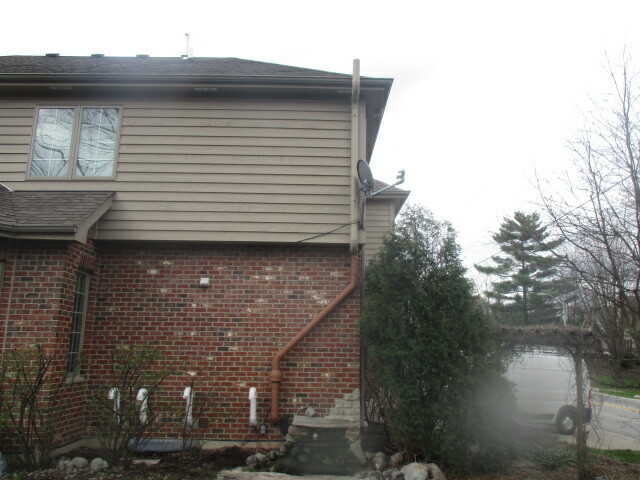 This home's Home Owner's Association wanted the system to be located on the backside of the home. We were very creative in our solution to meet the HOA's requirements. 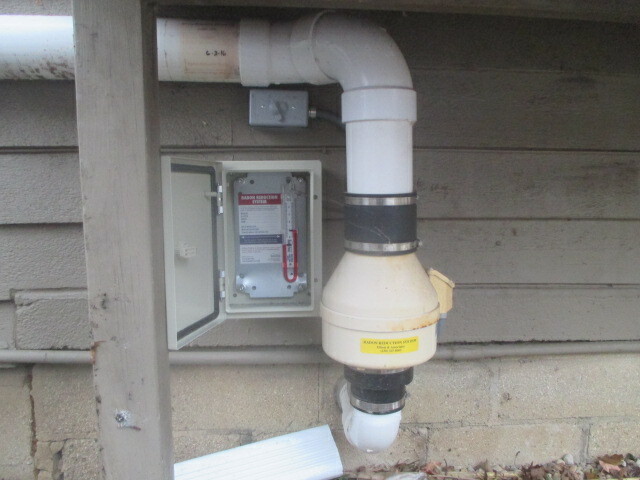 This is a picture of the exterior exhaust with the fan underneath the deck and exhaust running along the downspout on the rear of the house. 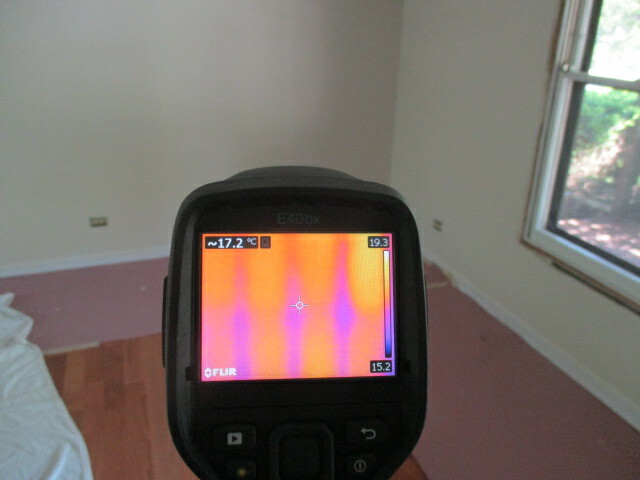 We use a thermal imaging camera to identify the location of the exterior studs to properly fasten the exterior exhaust. Why is this important? This extra step ensures the quietest system that will not fall apart even in the strongest winds. 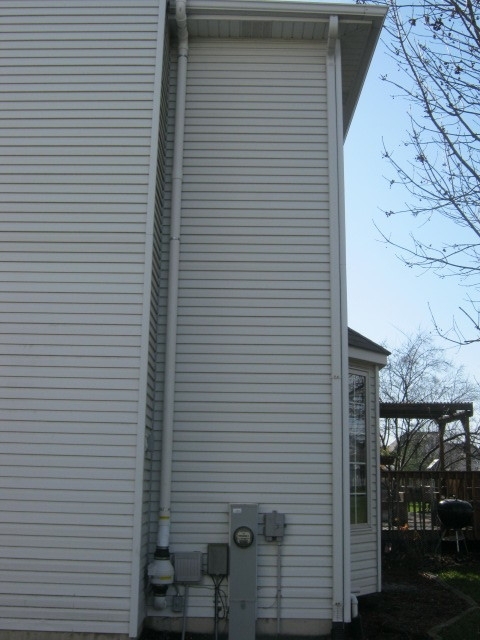 These extra steps provide the safest system so that the exhaust does not fall down and hurt someone or damage the house when there is severe weather. Why do we do all the extra work? Because our clients are worth it. We are always making improvement in safety and longevity of our systems so that we can better serve our client for many years to come. 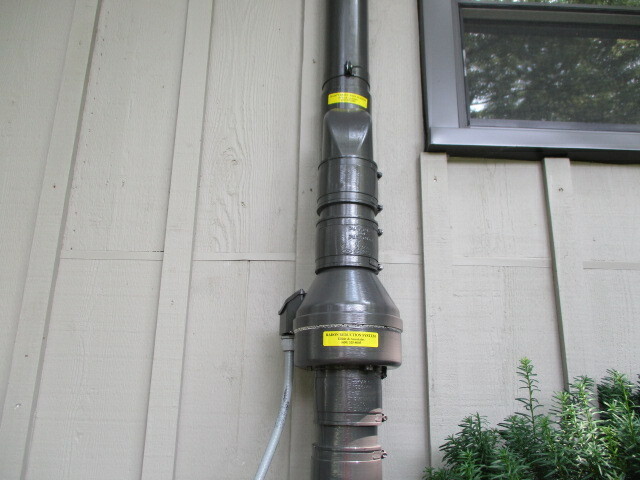 This photo shows an optional exterior fan housing that encloses the in-line vacuum fan. This housing can be painted. 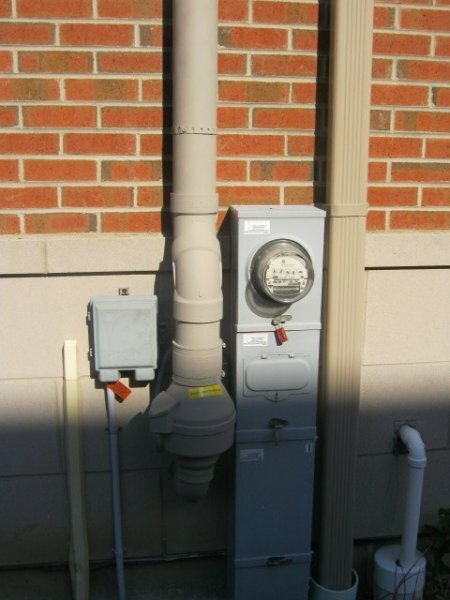 Installation of this housing is an additional charge. 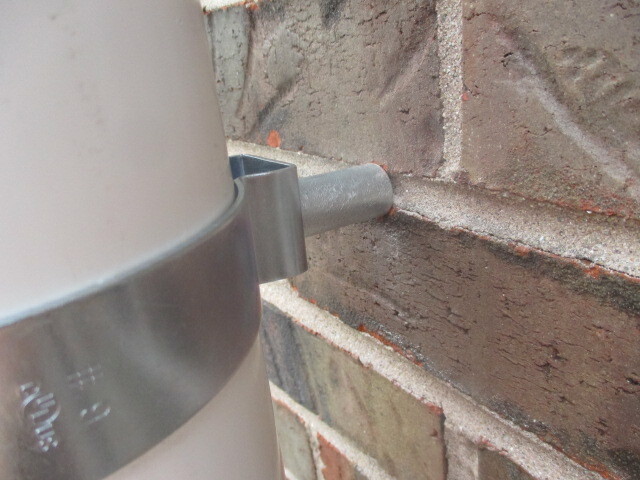 This picture shows why aluminum downspout isn't a good solution as PVC pipe for the exterior exahaust pipe. 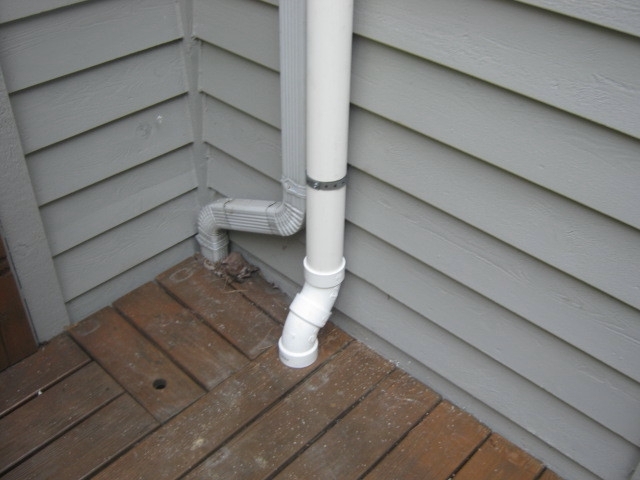 Downspout can leak air and moisture at the seams. 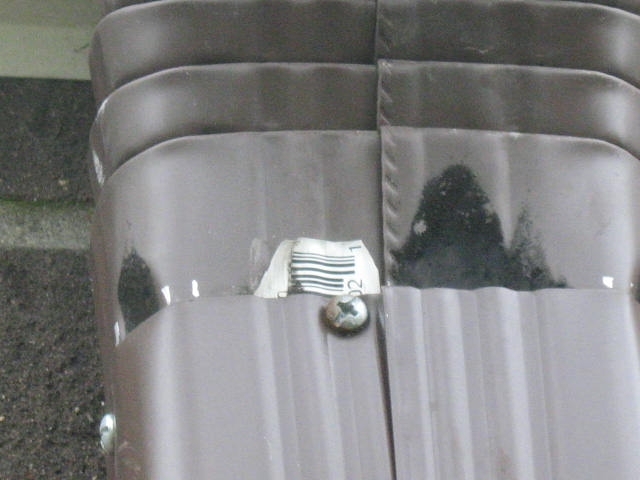 This photo shows mold growth at one of the seams. 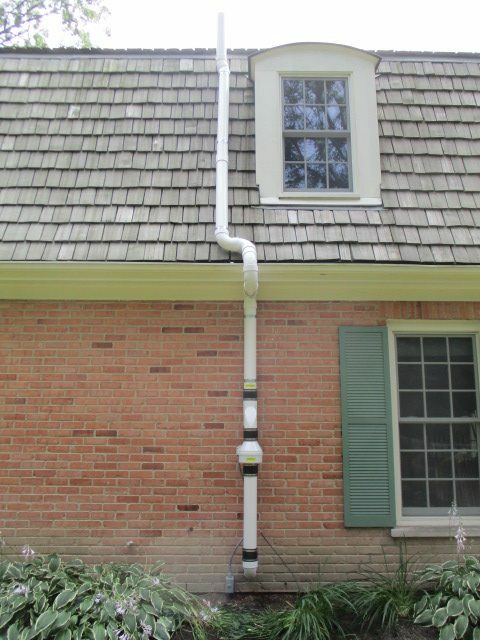 If downspout is used, it should be sealed at all the seams. Otherwise, radon gas and moisture will be illegally discharged. There will be an on/off switch within 4 feet of the fan. It should always be "on". 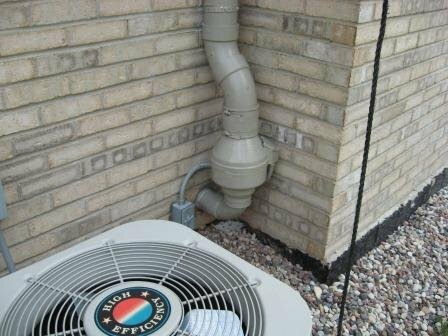 We are the only contractor making improvements on reducing the radon system noise by installing vibration collars on the exhaust pipe support system. This photo shows how we attach the exhaust to keep the fasteners and pipe as straight as possible, eliminating any unnecessary bends and turns, improving efficiency and aesthetics. 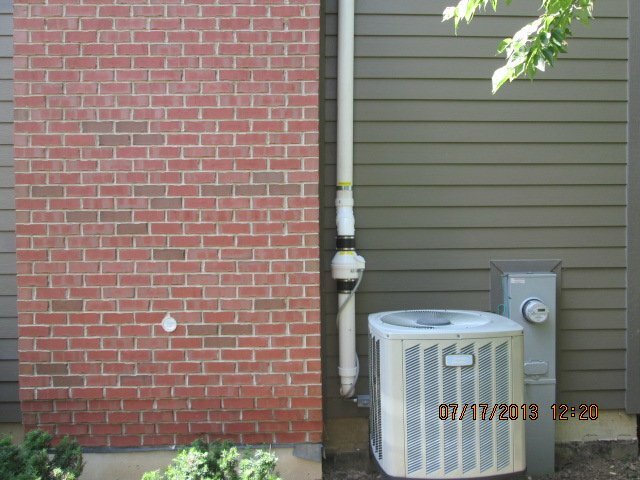 The brick and siding was not even, so to properly fasten the exhaust a spacer was used to bring out the exhaust an inch to seamlessly flow from the brick to the lap siding. Yes, this extra care takes time but lasts a lifetime. This extra care is what our clients receive and deserve. 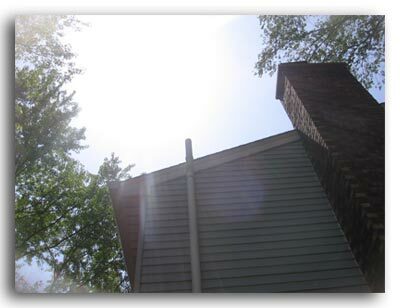 For this home we installed the exhaust pipe through the roof instead of going around the soffit to protect the architectural features of the home. We can get creative! 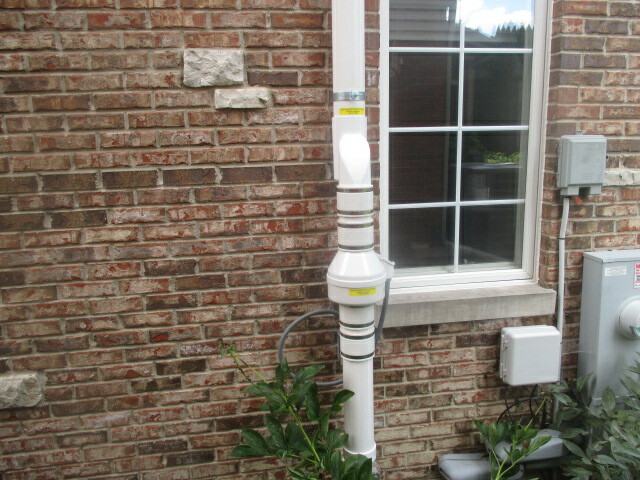 This radon system runs through an unused chimney flue and the fan is located on top of the chimney. 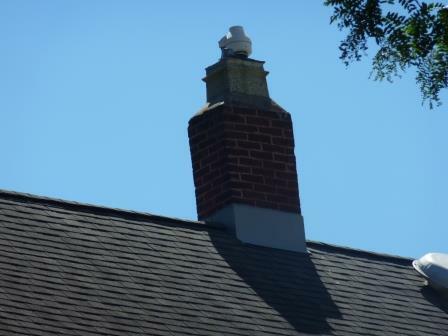 This innovative and creative placement of the rooftop radon fan saved the customer thousands of dollars and allowed them to enjoy the use of their rooftop deck! We rise to all occasions! This installation was a 4-story condo. 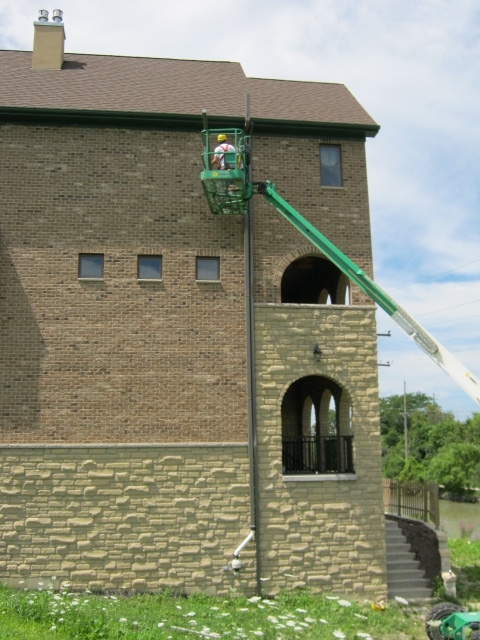 Four of our technicians are licensed to use aerial lifts.